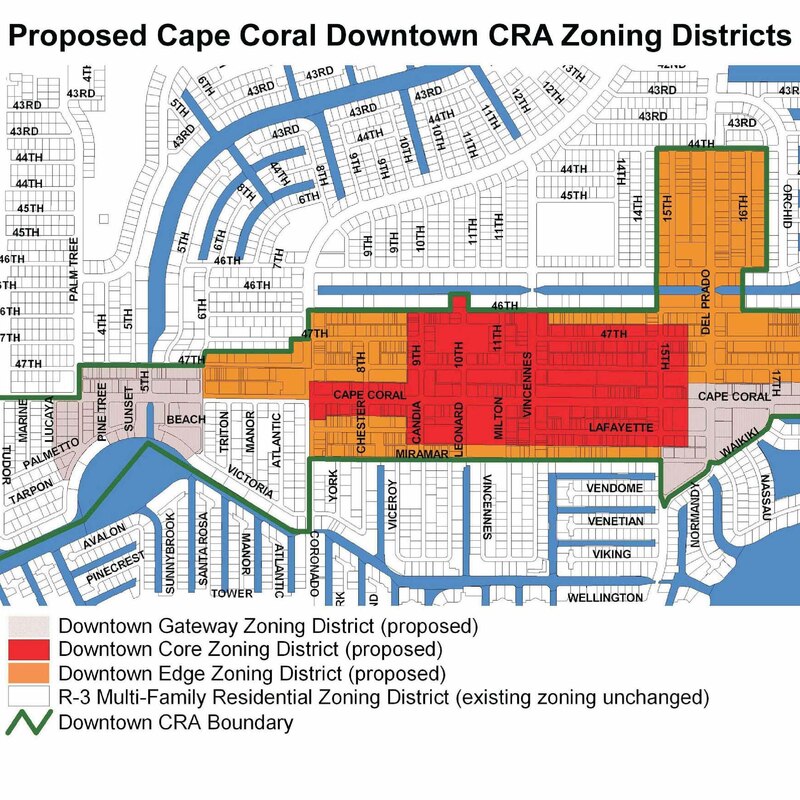 This page provides information about the 2002 Downtown Master Plan for Cape Coral. This plan was prepared for the Cape Coral Community Redevelopment Agency by Dover, Kohl & Partners, with Hall Planning & Engineering, ZHA, and Spikowski Planning Associates. Read the 2002 Downtown Master Plan for Cape Coral here. Learn about more recent planning by the Cape Coral Community Redevelopment Agency, including the 2030 South Cape Vision Plan, by clicking here. An early draft of a map showing the proposed application of the three new Downtown zoning districts to land within the Downtown CRA boundaries, dated May 6, 2003. A revised 11" by 17" color poster that could be displayed at city offices to explain to the public how a color palette could be used for selecting paint colors. The complete text of the December 20, 2002 draft of the proposed code, including graphics, in final ordinance format. The complete text of the December 20, 2002 draft of the proposed code, including graphics, in the original format (matching the first two drafts of this code); the original formats contain some text from the existing code that places the new language in more context than the ordinance format. A draft of the transmittal memorandum, which summarizes all significant changes that were made to the September 27, 2002, draft; the section references apply to both versions of the code, and the page references refer to the original format. The September 27, 2002, draft of proposed revisions to these codes is available by clicking here. Cape Coral has plan for downtown (April 11, 2010). Vision coming to life (July 7, 2002).